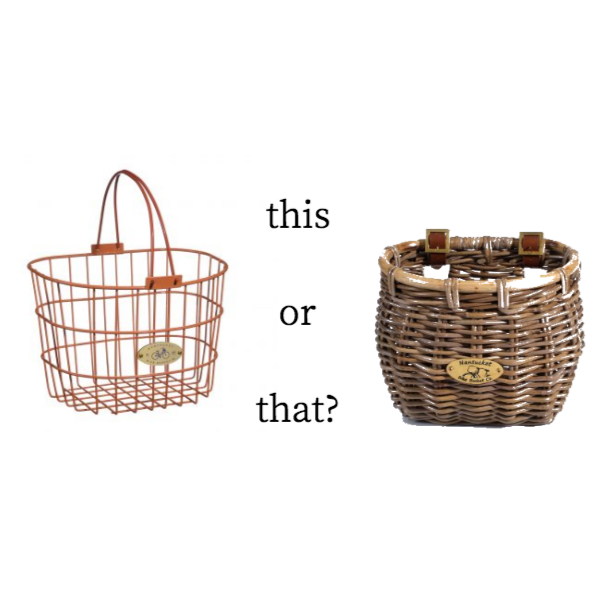 heather & olive: this or that: bike baskets. this or that: bike baskets. Once the weather cooperates, I plan on riding my bike to work and I'm in the market for a bike basket to hold my bag (in lieu of using a backpack). I love all of the baskets by the Nantucket Bike Basket Company and I'm leaning towards the wire version (although now I need to decide between the front and rear basket options--so hard). The only reason why I would say the non-wire one is things can't slip through the cracks. So, if you throw your keys in there or something it won't be a worry. I struggle with wire anything because I feel like everything falls through the holes. I love the classic look of the wicker basket. I am envious of your ability to bike places!